I headed south again for the second straight March for some desert peakbagging. Gimpilator has put up a bunch of great TR's for the area, so I wanted to go see Death Valley for myself to see a brand new area for me. I took an early flight to Vegas and got my rental car, it was so much quicker than last year by over an hour. I was driving 30 minutes after I got my luggage. After about a 2 hour drive, I stopped along the highway for a hike up Pyramid Pk 6703'. It was already pretty warm out with a breeze blowing. I should have put sunscreen on a little earlier than I did but at least I didn't get too burnt. I really enjoyed this hike, it had some cactus, some gully scrambling, lots of little lizards and great views of the Funeral Mtns. 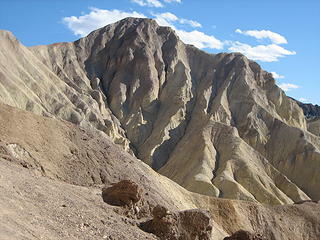 I still had some time left in the day and headed towards Death Valley to Golden Canyon. It was unique to start a hike -160' below sea level. I was hoping to climb Manly Beacon but many wrong turns in the canyon left me without enough time to find the proper way. This was still a highlight for me as the canyon was beautiful! I still had to make it to the little town of Furnace Creek to try and find something for dinner before everything closed. After grabbing a few snacks for dinner at the general store, I headed up the Furnace Creek wash road to find a place to sleep. I was aiming to park just East of Funeral Pk and sleep in the car to get an early start for that pk the next day. After leaving the paved road, the gravel road was in good enough shape that I was able to pull off and find a great spot to park before it got too dark. While getting ready to sleep is when I realized this small car I rented, didn't have enough room that I was planning on. I was hoping to pull down the back seats and have a nice surface to sleep on. That wasn't the case and I spent a very uncomfortable night switching between the front seat and the back since the trunk was out because of a huge level difference. Anyways, I learned that even in Death Valley, it gets pretty cold at night at 4000'. I started off towards Funeral Pk around 7am and was happy to start warming up. For a fairly easy pk, it was a bit annoying with all the sage brush and other desert plants in the way. there was almost no where I could walk in a straight line, the whole way was spent weaving in and out of the plant life. 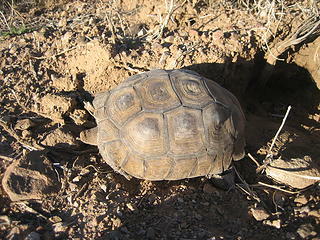 The coolest thing I saw was a tortoise ready to dive into a hole. I didn't expect to see something like that. I made it to the top with some good clear views of the mountains surrounding Death Valley. I headed down and found a slightly better way back to the car by following a dry wash for a while. 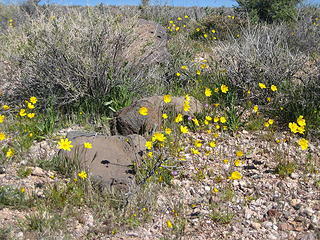 I also found a few yellow desert flowers. After the hike, I still had lots of time left in the day. I had several ideas but chose to do a couple shorter hikes to try and get the most out of the area to see what it has to offer. I drove up the Dante's View Rd and did a short hike up Coffin Pk. A brand new register was placed a couple days earlier that I signed. Next, I drove to the end of the Rd to a tourist spot for views. I'm glad I went there because the views down to the bottom of the valley were great with the snow capped mountains to the West towered above. I did a short hike up to Dante's View Pk and returned to the car thinking about my next plan. Since I was really wanting to climb the 11k+ Telescope Pk on this trip, I brought snowshoes. Who brings snowshoes to the desert? I did:) But, the access roads to the TH were closed due to storm damage, so I decided to head back to Nevada for the Spring Mtns. Before I left California, I did one more quick hike up a small peak on the other side of the road from Pyramid Pk. Those views of Pyramid were great and I was happy to get another short hike in before leaving. I grabbed some dinner near Vegas and drove up to the Mt Charleston area and parked along the road at the North Loop TH. The TH is at ~8200' and it got really, really cold at night. Again, it was very uncomfortable to sleep in the small car and it was below freezing in the morning. I started up the North Loop trail at 730 aiming for Fletcher Pk. 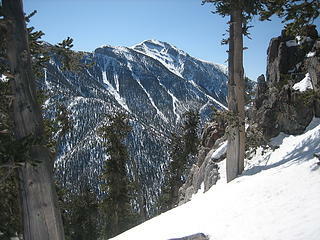 I put my snowshoes on and went up and over a few bumps along the way with great views of the surrounding, taller Mtns. I reached the 10236' summit and enjoyed the warm sun! I headed back down and did another short hike on Lone Mtn in the city. Then I checked into a room so I could get some decent sleep for the night. I woke early on Sunday and decided to take advantage of bringing my snowshoes with me and headed back up to the Mt Charleston area. 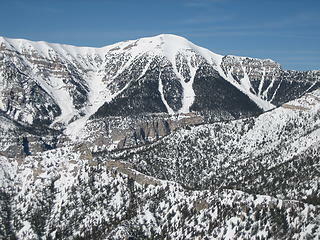 This time I would drive to the Lee Canyon ski area to start a snowshoe trip. By the way, it looked like a fun day of spring skiing going on there. I really missed my family at that point as I know they would have loved the slopes there. 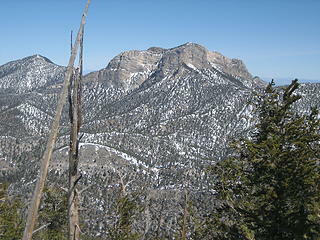 I started on the Bristlecone trail, which was full of about 4' of snow, with my goal of climbing Amargosa Overlook 10154'. I weaved in and out of little drainages and admired some pretty thick pine trees. I reached the ridge and there were still many ups and downs to go to reach the top. The views were great with many big pks popping up in all directions. I'd have to say this was probably the best views I had on the trip. I reached the summit and again, enjoyed the warm sunshine. I headed back down but before leaving, I walked to the ski resort to check things out. It looked like a very fun place to be at. It made me think that one of these years, I'd like to take the family down there to ski, while I enjoy some more surrounding snowshoeing pks. It was a very fun 4 day get a way. I hope to be able to do this every early spring. 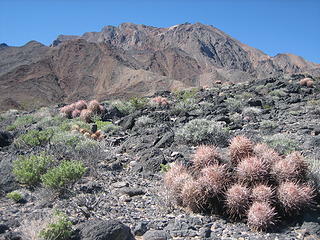 it was a bit annoying with all the sage brush and other desert plants in the way. there was almost no where I could walk in a straight line, the whole way was spent weaving in and out of the plant life. Bushwhacking in the desert, who woulda thunk it? Those desert shots are spectacular. Are those growth rings on that gorgeous tortoise shell? Sounds like a fine trip, Eric. No kidding. At this time of year while sleeping in my truck (with more room than your tiny rental car ) at the 8,000' trailhead to White Mountain Peak a bit north of where you were, the temperature fell to +4°F. That was a very lucky and rare tortoise sighting you had. Still haven't seen one myself. Manly Beacon is worth going back for, if you're in the area again. Funeral Peak is one of the few in Death Valley which didn't seem all that great. We did Fletcher a couple days ago and there's still a ton of snow up there. I'll have to look into the Amargosa one you mentioned. Not familiar with that. Nice trip!